1. What if I want to talk by telephone to a professional florist for advice or suggestions on sending flowers or gifts? 2. What happens after I order a gift online? Your online order is sent over a secure, encrypted connection to McAdams Floral by a secure, dedicated server solely operated by WebsiteCP. 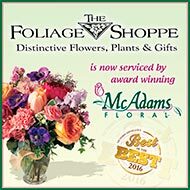 Upon receiving you McAdamsFloral.com order, you will receive a confirmation number to certify that the order has been placed. 3. Is my credit card number safe? Yes. 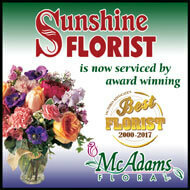 Ordering flowers and gifts from McAdams Floral is safe and secure. We us Secure Socket Layer (SSL) technology on your website which means all of your personal information and credit card number is encrypted before it is sent to our secure server. Our secure server is protected against unauthorized access. You never have to worry about your credit card safety. 4. What happens if I need to make a change in the delivery date, delivery address or card message to an online order? No problem. Just contact us by email (sales@mcadamsfloral.com) or telephone (361-575-2307) and give us your order confirmation number, we will make the changes. Please try to request any changes 24-hours in advance of the delivery date. We accept VISA, MasterCard, Discover, American Express, Diners Club and Carte Blanche or an established McAdams Floral House Account. We gladly welcome personal checks if you shop at our store in person. 6. When do you charge my credit card? We obtain authorization the day you place your order in all cases except orders over 30 days before delivery. Please note that debt cards will have funds immediately removed at this time. 7. What about state sales tax? You will be charged an 8 1/4% sales tax on all products and service charges, regardless of your location, as directed by the State of Texas.